Our Just For Her Hamper is the perfect way to indulge the lady in your life, the Cornish way! 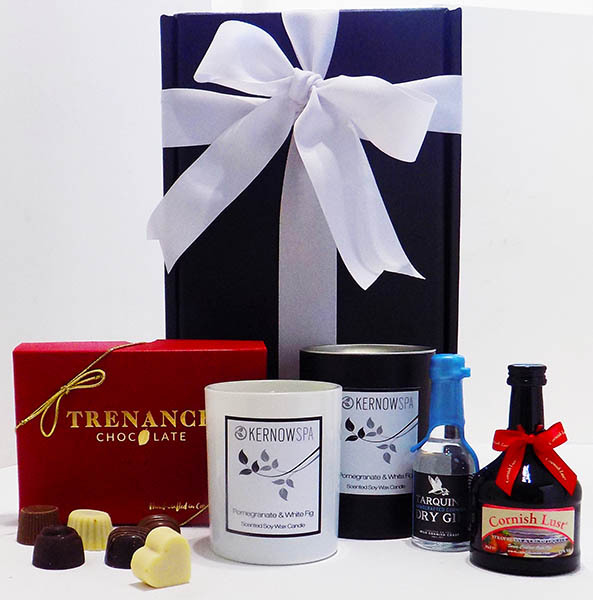 Whether it’s for your wife, partner, mum, sister, girlfriend, colleague, we’re sure she will enjoy these melt in the mouth luxury handmade chocolates, magical miniatures and fragrant Cornish Candle. Bringing back memories of sunny tranquil days amid the wonderful sights and sounds of Cornwall. Just For Her Hamper is carefully wrapped and packaged by hand and presented in a classic Cornish black gift box hand tied with gross grain ribbon. A Cornish St Piran Flag with a delicious surprise inside! Hand written Cornish themed Greetings Card for your own message is included.